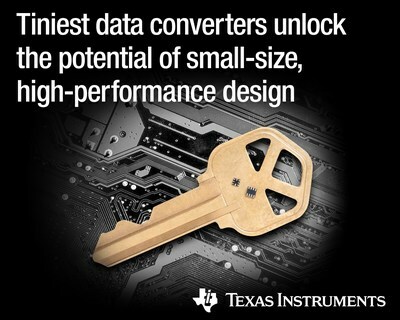 DALLAS, Dec. 3, 2018 /PRNewswire/ -- Texas Instruments (TI) (NASDAQ: TXN) today introduced four tiny precision data converters, each the industry’s smallest in its class. The new data converters enable designers to add more intelligence and functionality, while shrinking system board space. The DAC80508 and DAC70508 are eight-channel precision digital-to-analog converters (DACs) that provide true 16- and 14-bit resolution, respectively. The ADS122C04 and ADS122U04 are 24-bit precision analog-to-digital converters (ADCs) that feature a two-wire, I2C-compatible interface and a two-wire, UART-compatible interface, respectively. These new devices join a portfolio of precision ADCs and DACs optimized for a variety of small-size, high-performance or cost-sensitive industrial, communications and personal electronics applications. Examples include optical modules, field transmitters, battery-powered systems, building automation and wearables. For more information, see www.ti.com/smallestDACs-pr and www.ti.com/smallestADCs-pr. Maximize system accuracy and achieve higher reliability: In addition to their compact size, the DAC80508 and DAC70508 provide true, 1 least significant bit (LSB) integral nonlinearity to achieve the highest level of accuracy at 16- and 14-bit resolution – up to 66 percent better linearity than the competition. They are fully specified over a -40°C to +125°C extended temperature range and provide features such as cyclic redundancy check (CRC) to increase system reliability. Evaluate the new data converters with the DAC80508 evaluation module, the ADS122C04 evaluation module and the ADS122U04 evaluation module, all available today for US$99.00 from the TI store and authorized distributors. Engineers can jump-start their designs using the DAC80508 with the reference design for laser diode applications with precisely controlled current requirements and the ADS122C04 and ADS122U04 with the high-precision temperature measurement for heat and cold meters reference design. Designers can simulate their designs and predict circuit behavior for these data converters by downloading the DACx0508 input/output buffer information specification (IBIS) model, the ADS122C04 IBIS model and the ADS122U04 IBIS model. TI’s new tiny DACs and ADCs are available with packages and pricing as listed in the table below. The DAC80508, DAC70508, ADS122C04 and ADS122U04 devices are available in production quantities through the TI store and authorized distributors. In addition to these devices, TI’s portfolio of small-size data converters includes the single-channel DAC80501, the four-channel DAC80504 and the 12-bit DAC60508, which allows designers to easily scale performance up or down to meet their system requirements. Additionally, options for cost-sensitive applications are the TLA2024, a 12-bit, four-channel ADC, and the DAC53608, a 10-bit, eight-channel DAC. Download the DAC80508, DAC70508, ADS122C04 and ADS122U04 data sheets. Read this short technical article and learn how using small precision DACs can improve performance in laser-drive applications. Watch the TI Precision Labs training video series on ADCs. Check out all of TI’s data converter devices. Search for solutions and engage with fellow engineers and TI experts in the TI E2E™ Community Data Converters forum.